If you use a Gmail account, do you want your mails to be more organized? If so, you should use labels. They are like email tags, or categories. Don’t worry. This post will explain everything. The main reason is to make your mails more organized. And, this is how they help to organize it. For example, you subscribed to Mashable, a highly popular tech blog, using Gmail. 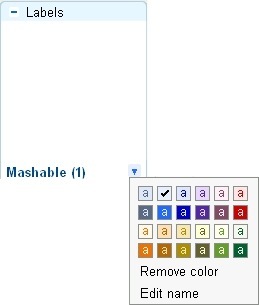 You could create a label named ‘Mashable’, and apply that label to all Mashable updates. You could edit the ‘Mashable’ label so that it becomes blue. 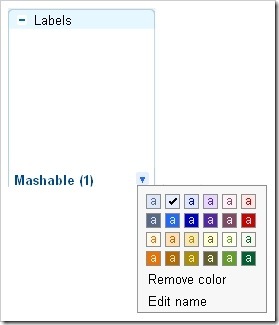 When you see a blue color label, you know it’s from Mashable. You would know that is a Mashable mail in the middle of many other mails is about at first sight..
At first sight, you would probably know where the email came from, and you wouldn’t have to carefully read the titles. They help to group emails. Is it easier to find a nail in a box of marbles, or a box of nails itself? If you click a label, you will be brought to a page where all the mails with the label are. That would help you to be more organized. Yeah…I guess, if you explore Gmail you might know how to apply labels. Select an email and then click apply label, “the label’s name”. But do you know that you can create a filter that automatically applies labels to those incoming mails? Here’s how to set up labels. …and you will be taken to this page. Select “Apply the label”, click choose the label which you want your subscription to be in. When your subscription arrives at your inbox, the filter will apply the label you have selected to it. Pretty good, eh? Different labels are more visible when they have different colors. By default, labels are set to gray. In the left side of Gmail, there is a tab called labels. Click on the color of the label, and click the color you wish to apply the label. Gmail is the best web mail, according to me and many others. And here’s why. Its labels and filters are some of the main reasons I like Gmail. So, I decided to write a post on it. When I first discovered labels, I thought they are some kind of categories. I started applying them to some of my mails, until I got tired of manually applying them. I stopped using labels then. One day, in the ending months of 2008, I stumbled upon a post on the security meltdown in Gmail. The security meltdown of Gmail lets hackers to secretly create a Gmail filter, which sends some emails, including the ones that tell you your username and password, to the hacker. The post told me to check my filters to see whether any unexpected filters were created. That’s what I did. That got me into experimenting with the filters. That’s how I discovered how to automatically apply a filter. Ever since I applied this method, my mails have been more organized and easier. Now, I am a fan of filters.